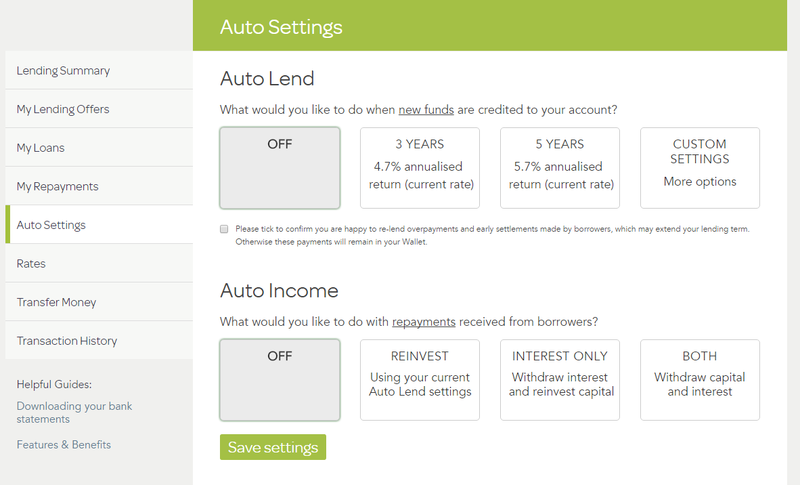 Lending Works is a ‘hands-off’ investment platform which offers peer to peer personal loans. It targets lower risk consumers with higher credit ratings. It offers both a provision fund and additional insurance to protect against default on all its products. Since officially launching at the start of 2014, Lending Works has lent out over £39 million. Expected Returns: 5.0% 3-year term, 6.5% 5-year term. Provision Fund: Yes, has additional insurance too. Sell Out: Yes, but fee applies. Cashback: £50 if you invest £1000 for a year (all referral links here). Innovative Finance ISA: Yes! But they release in £1million tranches and demand is high. Fraud and cyber-crime: if somehow fraudulent applications are approved after their systems have been compromised. Loss of Employment: if a debtor loses their job and so can’t pay back the loan. Accident, sickness and death: if the debtor is unable to repay for one of these unfortunate reasons. For me, the only other points of interest is the (slow) speed of investment and the fines on withdrawing money early. When I first invested with Lending Works back in 2016 it was really slow to fully invest your money. It took me about a month invest £1000 in the 3 year fixed term product. Unlike other platforms that continually allocate a small amount of your investment to new loans that become available, Lending Works sits all of your cash as a lump sum at the back of the queue. Reinvestments take priority over new funds, so you’d hope that the investment lag is a one off problem for your new funds. This means that whilst you may have an estimate of 7 days on the 29th of a month, by the 1st of the next month it could be back up to 9 or 10 days as all previous earnings jump the queue. The algorithm they use to estimate the remaining days is inaccurate too, at least in my case. Lending Works do vary their rates every week or two, so this would presumably help with demand and slow investment speeds. Since 2016 it has become faster to lend new money. Lending Works allow you to sell your loans early, subject to demand. However there are fees: they charge either 0.6% or £20, whichever is greater. This is still better than the 1% sell out fees charged by Zopa on their longer term products, or the potentially even harsher charges imposed by Ratesetter. Lending Works is a good hands off product. For existing investors, its great that you can skip the queue to reinvest your earnings. It’s also a nice feature to be able to set it to automatically repay interest to your bank account each month. Lending Works go to great lengths to offer protection against losses via their provision fund and the additional insurance. I’d be interested to see hard data on if/when the insurance was actually called upon. For me, the returns of are not particularly stunning, but it’s easy and relatively secure. It’s worth a try, particularly if you just try it out with £1000. Including the cashback, returns on the 3 year product would be boosted to around 10%. I’ve been really disappointed with Lending Works since I started with them 7 months ago. Despite that LW tell me that my “weighted average” is 4.5%, I’ve calculated my actual returns as less than 3.9% annualised. I feel LW is misleading. The loans your money is lent out to may indeed say 4.8% or 5.3% or whatever, but the actual net returns in your pocket at the end of the year are way, way less.